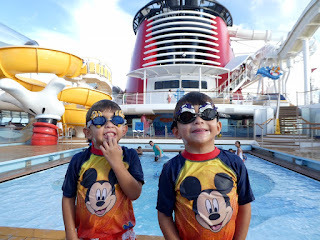 Our first Disney Cruise and cruising with toddlers / prek kids on Disney Dream. Growing up I had went on three memorable cruise ships with my father. We even sailed on Disney's The Big Red Boat when I was a little girl. During these vacations together, just the two of us, we made memories I'll forever cherish. These trips are even more poignant now that he has passed away. 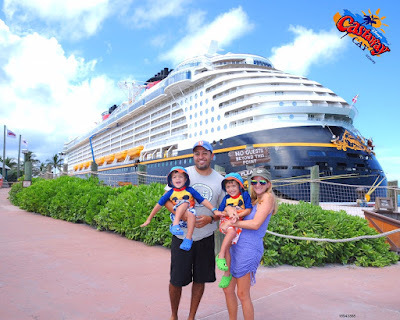 Now, over 25 years later, I was able to travel with my own children on a magical Disney Cruise voyaging on the Disney Dream for a 3-night sailing to the Bahamas and Disney’s private island Castaway Cay. The cruise exceeded our expectations and was an unforgettable family experience that I know I will always treasure too. 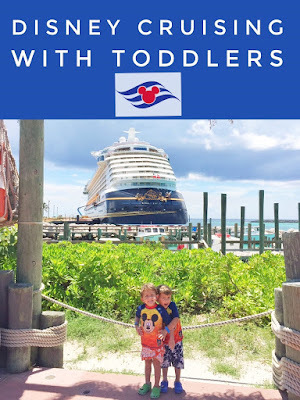 While Raphael and I have gone on several cruises as a couple, this was the first time we took our almost four-year-old twins aboard and our first time experiencing Disney Cruise Line. While we always planned to take our boys eventually, we had assumed they were still too young to enjoy and appreciate it, but evidently, we were wrong. During the week's leading up to our trip, our boys kept telling everyone they met that they were going on Mickey's boat. Their excitement was almost palpable and turned into pure joy once aboard. Yet, I still worried how it would go once at sea, would they get seasick, would they be able to sleep in bunk beds, what about the dangers of the balconies would they be okay being left at the Kids Club for awhile when we dined alone one night? During our sail, we learned that the ship was built specifically in mind for children and families. All openings and railings were double-checked to make sure a child's head couldn't fit through them. Even our stateroom's balcony had glass slats in between the bars for extra protection and security. Such wonderful peace of mind for parents. Disney Cruise Line is also the only cruise ship that has lifeguards on duty at their pools, as well as on the beaches of Castaway Cay. I observed first hand how diligent these aquatic guardians were in their watching when they quickly came to the rescue of a fatigued 8-year-old girl within seconds even before her parents who were standing nearby had realized what had happened. 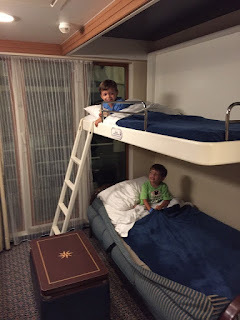 I was especially amazed to learn that the 5th floor, where the kids club can be found on the Disney Dream, has lower ceilings just to make children feel more comfortable. It's touches like that which assured me they were in good hands! Disney’s Oceaneer Club and Oceaneer Lab are open to 3-to-12-year-old children and transports kids to the magical lands of Disney fairies, friendly monsters, adventuresome toys and undersea exploration. The space is large, but well staffed and full of entertainment. It's more of a supervised play space than a school or daycare program though. 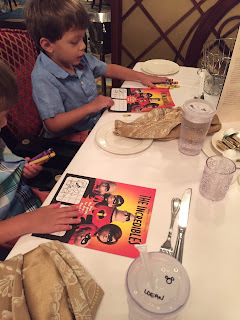 I feared our boys would be overwhelmed by it, but there was so much for them to see and do they were too busy exploring and playing to think about it. They primarily played in the toddler-friendly Andy's Room and colored in Pixie Hollow. Meanwhile, seeing a Star Wars Millennium Falcon replica had this mommy tripping! It was all I could do not to sit in the captain chairs and press warp speed myself. During our trip we checked them into this area after breakfast, but before lunch for two hours while Raphael went to the gym and I went off to explore the ship and take photos. We also utilized this free convenience one evening to partake in the adult-only restaurant- Palo. As soon as our meal was over, I hurried to pick them up thinking I was rescuing them. Silly mommy. Instead, they started whining when they saw me, because they didn't want to leave. Apparently, they had just made cookies with a chef and were waiting to have their treats. They had on little pastry chef hats and aprons, it was adorable! Adults are only allowed in the kids area during open house hours. Thus, I felt confident they were secure and in good hands when we were not with them. Also, in order to check children in and out of the kids club area a password is required along with scanning a child's Magic Band, which are provided to children once you register them into the system. Kids club staff can also locate exactly where your children are via these bands. So, when we picked them up the front desk area they would tell us which room each boy was in at that moment. TIP: The kids club is also available on land while at Castaway Cay, it's called Sculley's Cove and is essentially a big beach sandbox for kids to play. You could drop off kids at the cove for a bit and check out the adult-only beach on the island for a bit. Meanwhile, for infants and toddlers not potty trained there is the It’s a Small World Nursery (included in the video below as well), however, this childcare area costs 9/hr, but still a bargain compared to babysitter rates. I thought the space was calm, colorful, and great for little children. TIP: Pre-register your children online for the kids club, so when you get on the ship you simply have to pick-up their Magic Bands. Also, don't forget to return the bands before you disembark or you will be charged for them. I was really impressed with the quality of food options, service and attentive staff. Although you are assigned a set time and table to eat at each night, Disney Cruise Line developed an innovative rotational dining concept that remains exclusive to the Disney fleet. Guests get to enjoy different restaurants for dinner each night and still have the same set of servers who also rotate with them. This way, guests enjoy a variety of dining experiences with friendly, familiar, personalized service. Animator's Palate was by far the boys' favorite dinner thanks to interactive video walls featuring the turtle Crush from Finding Nemo, who would play games and talk to the dinner guests around him. Very similar to Turtle Talk at Epcot. Even when Crush wasn't making an appearance, different characters would float by making appearances and entertaining our little ones. They would get excited each time they'd spot another familiar character. There was also this part where a school of fish kept making different shapes and objects and encouraged the children to call out what they were forming e.g. a boat, a pirate flag, etc. Ben eagerly yelled out Boat to the screen, it was great seeing him so engaged while their food was being prepared. We also had a romantic dinner at Palo without the children one evening. This restaurant requires a reservation and is for adults only. There is an extra charge of $30 per person, but it was well worth it thanks to plush tables that overlook the ocean on the top deck. Time your dinner to close to sunset for extra romance. The lobster linguine and strip steak were amazing. Be sure and order the souffle for dessert too. More on this experience here. Room service is also included and we ordered PB&J to the room for the boys. Another easy option is the to-go stand, Flo’s Café for a quick bite up on deck 11 by the pool. TIP: If you're with younger children be sure and request the 5:45 p.m. dining time as the other 8:15 option is too late and you'll have to rush to catch the live shows after too. You can also make a reservation for adult dining at Remy or Palo online before you set sail. Besides the water sides, pools, splash pads, movie theater (we watched Finding Dory again! ), mini golf and ongoing schedule of fun activities, Disney Cruise Line ups the entertainment ante and lights up the sky with a fireworks extravaganza like only Disney can do. Every night is show time in the Walt Disney Theatre, an elegant 1,340-seat entertainment palace that spans three decks with orchestra and balcony seating. We weren't sure how our boys would do during a live theater performance, but they were glued to their seats thanks to the familiar songs, colorful costumes, high value sets and spectacular stunts like Tarzan spinning from a rope in The Golden Mickeys' to Mary Poppins flying on stage in Disney's Believe. Best of all, we enjoyed the shows as much as the children. It felt like we were on Broadway. On a Disney cruise, staterooms are family-size and come with a split bath with a tub AND a shower. 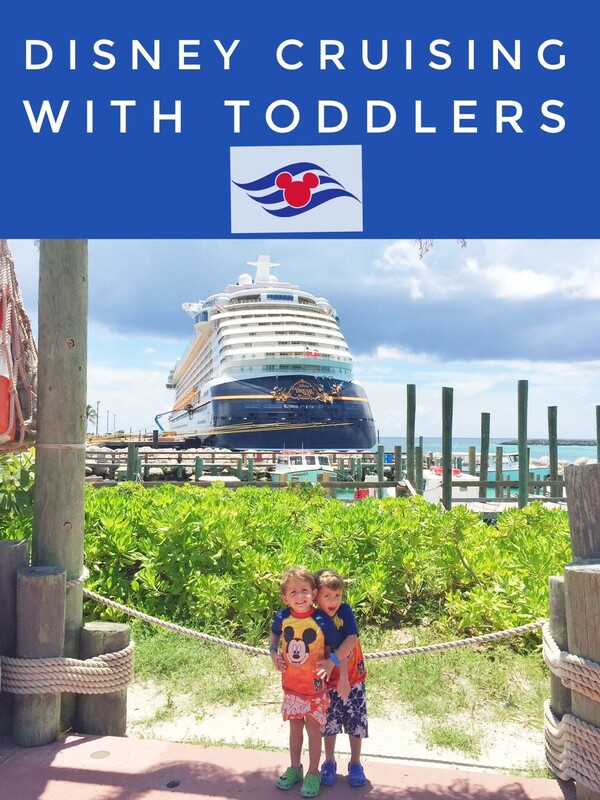 We've never been in a cruise room with a tub and it was ideal for bathing the boys after their sandy adventures ashore on Castaway Cay. 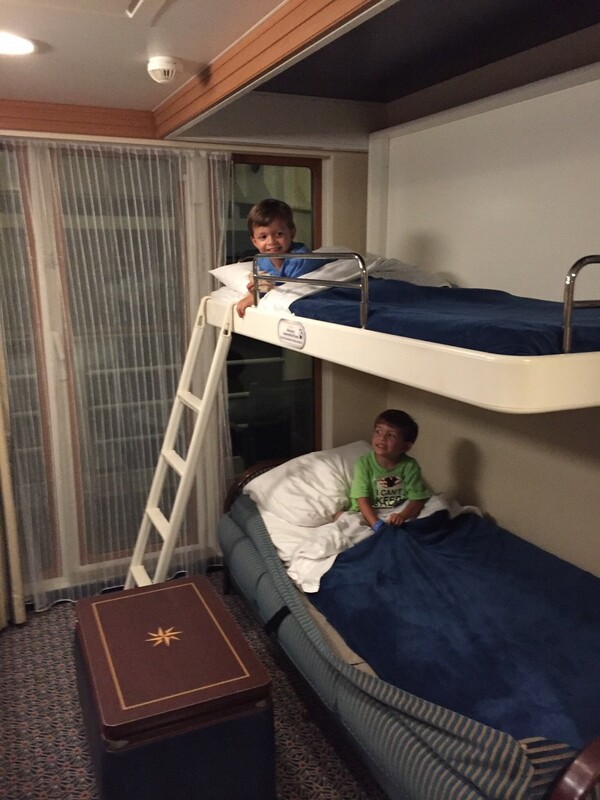 The boys especially LOVED the bunk bed option in our room with the sofa converting into a bed and the upper part folding down from the ceiling. Each night our steward would open it for us and have the beds ready for bedtime when we returned to our room. Best of all, there is a privacy curtain in the room separating the bunk bed area and the Queen size bed, which was a super comfy mattress for a cruise ship by the way. This privacy screen allowed us to do some reading after they turned in, making the room feel like two bedrooms instead of one. Such a great feature for families. Oh, and besides the live channels offered on the flat screen television in the room there is an on-demand movies feature available on the Disney Dream, where you can access almost all of Walt Disney’s animated films regardless of them being in the Disney Vault or not. This allowed us to show the boys some classics that we didn’t have on DVD like Snow White and the Seven Dwarfs and The Lion King. This was great because we could always put on age appropriate content for them while we got ready or packed. Disclaimer: I traveled on the Disney Dream as part of a FAM Media Tour. All thoughts and opinions though are of course my own. Seems like you had a great day on a cruise! We are planning to and saving for motor boat someday.